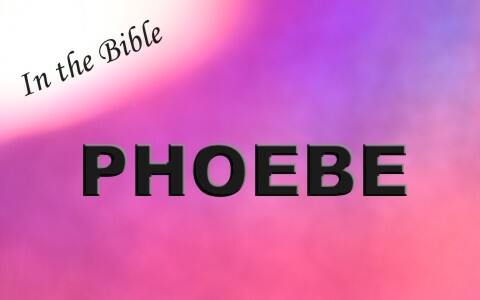 Who was Phoebe in the Bible? Was she a deaconess? Are there still deaconesses in the church today? Phoebe was apparently a deaconess in the first century church. Today, most churches only have pastors, elders and deacons but a church having a deaconess is biblical. Our little church has a deaconess and when we see what Phoebe did, she was apparently doing the work of a deaconess. There are only two verses in all the Bible that mention Phoebe by name and we find them in Romans 16:1-2 which says “I commend to you our sister Phoebe, a servant of the church at Cenchreae, that you may welcome her in the Lord in a way worthy of the saints, and help her in whatever she may need from you, for she has been a patron of many and of myself as well.” Apparently Paul believed that Phoebe was a “patron” for many and for Paul too. Paul asked the church at Rome to “welcome her in the Lord in a way worthy of the saints” because she was a great help to many. Phoebe was not a Jew but a devout Christian who bore without change and without reproach the name of the Moon-Goddess of the Greeks and was so highly commended because she had shone as a light for Jesus, the “Light of the World” and lived up to the meaning of her name which means “Pure or radiant as the moon.” Paul calls her a sister meaning she was part of the Body of Christ, the church but she was also a “servant of the church at Cenchreae” meaning she served the saints in the church which is what a deaconess does. The Greek word for “servant” where Phoebe is mentioned means is “diakonos” from which we get our word deacon from, so she was a slave of Christ and the church, devoting her whole substance to the church. Phoebe the Deaconess occupied such a position in the church and as such could be a teacher of many of female inquirers of the faith and since she was a deaconess, she would have been active in the relief of the temporal needs of the poor among the flock. From the verses that mention Phoebe it is generally assumed that this letter was taken to Rome by her and in commending her, Paul asks that the Roman Christians “receive her in the Lord,” meaning that they should give her a Christian welcome and that they “help (assist) her in whatsoever matter she may have need” of them. From all of this we know that Phoebe had undoubtedly ministered to Paul during his visits to Cenchreae. Phoebe was a crucial part of the church in Rome and in all of Judea as “she has been a patron of many and of myself as well” meaning that she served Paul and certainly the church in general as the office of deaconess is meant to be. Today, you can still serve the church, whether you’re a pastor, deacon, elder, or deaconess. We are all members of one body serving Christ Who is the Head of the church. If you are a woman, do you do the work of a deaconess? Do you present yourself as a servant to the church and to other Christians? We are all called to do so regardless of whether we’re a man, woman or even a young adult. I truly enjoyed this article. There has been a lot of confusion and debate about what the Bible says women can do as positions in the church. This gives us and answer that seems to be well balanced. And I was recently leaning towards this conclusion but now I have gotten the confirmation I required. I appreciate the insight! Previous post: Is Cheating On A Test or on School Work A Sin? Next post: What are Five Important Qualifications Of A Pastor That A Search Committee Should Look For?